3 Can Back Massagers Help You with Back Pain? In recent years, back massagers have seen a lot of technological improvement. They are a piece of heaven for those who are going through back pain and discomfort, and they have become useful home accessories. This is particularly the case if you do not have time to go for a professional massage salon. But who needs professional masseurs when you have the best back massager? A massage therapist will charge you money every time you use their services. However, a back massager will only charge you once: when you buy it. Still, considering that finding a good model is not all that easy, you might need some help. To come to your aid, we have gathered the back massager reviews for you, and we will also give you some tips and tricks to make the right choice. Dimensions : 17 x 14 x 31"
Dimensions : 31.5 x 17 x 6.4"
Dimensions : 20.9 x 16.1 x 7.1"
Dimensions : 13 x 9.5 x 3.5"
Dimensions : 15 x 8 x 7"
If you are looking for a convenient massager that will tackle every problem area of your body, you might appreciate the Snailax back massager. Providing the ultimate comfort, this can be attached to anything from a sofa or a recliner to a couch, an office chair, or even a car seat. 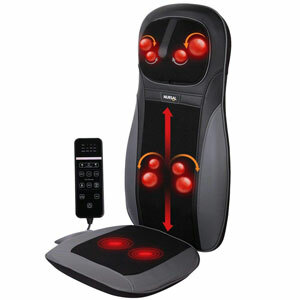 The massage pad in itself features four massage nodes that you may use based on your own comfort. Plus, you may adjust these nodes up and down your back. So, no matter if you need a neck massage or a lower back massage, you might be able to find comfort with this unit. What likely makes this massager pad such a convenient option is the fact that it also brings Shiatsu massage in the comfort of your own home. You can go for a full back massage or one that tackles specific points. Plus, if you feel like it, you may go for the heating option. Every chosen feature might be controlled for its intensity. Thus, this item is a great choice for those who do not know exactly what type of massage they need. 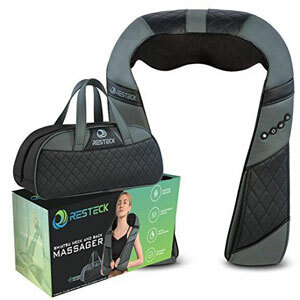 If you want to get a high-quality massage, then this back massager is certainly something you might want to invest in. Featuring four rolling nodes that provide deep kneading massage, this chair is very effective at relieving tension. You can choose either of the two massage modes: clockwise and counterclockwise. No matter which option you choose, you can pair it with the heating function. Therefore, you’ll get a relaxing and satisfying massage. 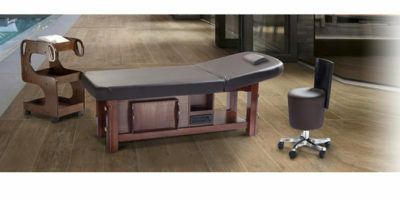 Featuring rolling massage and back shiatsu, this unit is perfect if you are having chronic back pain – particularly the kind that needs intense massaging. You can also adjust it so that it reaches a particular spot more effectively. If you are looking for something simple, effective, and relatively compact, then you might want to give this unit a try. All you have to do is drape it around your shoulders – and then let it do its job. Plus, considering that it has been equipped with handles, you can maneuver it until the perfect spot is reached. 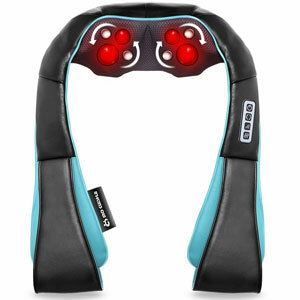 This shiatsu back massager puts you in control – in the sense that you don’t only have to use it for your back and neck. You may use it for your feet and legs as well. You have four buttons that allow you to control the massager – giving you various options for the vibration and heating setting. This massager has an A/C adapter, but also a car adapter. Therefore, if you tend to travel a lot, this one allows you to pull over and offer you relief. This way, it will be much easier on your back until you reach your destination – and it will take away your pain. The thing that makes this model so popular is the fact that it has 8 kneading nodes. As a result, you will get a higher-intensity massage, making it perfect for those that have issues with chronic pain. Featuring advanced heating, this back massager can provide enough warmness to soothe your muscles and relieve the tension. Plus, considering that it was made from breathable mesh, the massager itself is highly low maintenance. 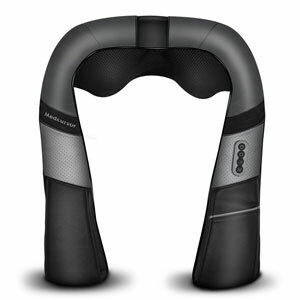 This massager can be draped around the shoulder, providing the relief that you need. It is even compact enough to be used in the car. Just make sure that you are not using it as you are driving. You don’t want to be too relaxed. If you are looking for something compact enough to place inside a travel bag, then this massager might be a great choice. At around 2 inches deep, you may easily secure it to your chair so that you can get the relief that you need. It may be small in size, but the unit is actually very powerful. Its Shiatsu massaging nodes offer deep massaging, whereas the change in direction will imitate the massage given by a real masseuse. You may change the speed if you have sensitive back issues (such as spinal stenosis). Going from low to high intensity, you can choose the one that brings you the most comfort. This way, it is a great option if more members of your family have back pain. They may choose whichever option is more comfortable for them. If you are looking for massagers on a budget, then this one might certainly suit your convenience. Featuring a variety of settings – from heat to shiatsu and massage speeds – this is the perfect unit to take with you no matter the source of your back pain. This unit has a safe and convenient design that prevents it from overheating if left on for too long. This way, even if you fall asleep during a very relaxing massage, you do not have to worry about any overheating. Plus, considering that it features handles, you may pull the massager along until you reach the perfect setting. With its ergonomic design, this massager can be easily carried with you in a bag. You can also attach it to your car using the adapter – making it a great choice if you are on the road a lot. When in doubt, always go with the pillow massage. Thanks to its compact form, you can place it anywhere it hurts – allowing you to reach that particular spot that has been bugging you. Due to its 3D rotating massage nodes, you will get a deep-kneading massage in the shiatsu style that will relax your muscles greatly. Plus, you have a heating option that you can turn on and off whenever you want. If you are not particularly sure which massage speed setting works best for you, you may also adjust it with this model. This also makes it a great choice for families that have different requirements. Made from environmentally-friendly materials, this pillow massager is not only very easy to clean, but it feels comfortable on the skin as well. Regardless of the area that you choose to massage, there will not be any issues with overheating. Back massagers are a great way to relieve tension and tackle the pain points in the body. That being said, there are many benefits of back massage that you might want to be aware of – and a back massager can help you achieve just that. This is the most obvious benefit of opting for back massagers: pain relief. Since massaging can stimulate circulation and relax stiff muscles, a back massager can provide short-term relief for pain points in your back. When you get a massage, various nutrients and oxygen are sent towards your muscles’ cells – “waking them up,” so to speak. This will improve your circulation, making you feel overall better – and with fewer painful episodes. Regular back massages can help improve a person’s sleep. If you are suffering from a sleep disorder, it has been showed that a daily back massage can soothe the nerves and improve your sleep. It has been proven! Back massagers make you happier – and there’s science to back this up. When you are undergoing a massage, endorphins are released in your body, relaxing the nervous system and thus creating that “feel good” hormone. For this reason, many medical facilities use back massagers for anxiety and depression. When it comes to the types of back massagers, there are two main categories that you can go for: electric or non-electric. That being said, both categories will branch once more into several different categories. No matter if you are looking for a small massager that you can hold in your hand or one that covers your entire back, there are several styles and types that you may go for. Electric back massagers are usually bigger in size, and function thanks to a motor. Generally, they emit vibrations at different speeds, and they solicit minimum activity from the person. The chair back massager is a piece of furniture that you add to your home – usually having a design similar to an armchair. These massagers can be used for all-day relaxing, and you can watch your favorite TV show while getting a good massage. Granted, these chairs are fairly expensive – but for the long run, they are a great choice if you need a hands-on massage. If you do not feel that you have enough budget for a chair massager, you might want to go for a chair pad. They are just as efficient and have the same coverage – only that you will not have to get rid of your favorite chair to make the switch. All you have to do is attach it, connect the hooks, and you will be ready to go. If you have a pain point that is particularly difficult to reach, then a handheld massager might be exactly what you are looking for. These massagers usually take the shape of a pad or a wand that you have to maneuver yourself, therefore getting exactly to the point of pain. It is a great solution for pain points that cannot be reached with a classic chair pad. If your main pain spot is generally set around the lower back, you might want to go for a belt back massager. This can be wrapped around the area, focusing on that particular spot. It can also be wrapped around the shoulders, providing relief in that particular spot. A pillow or cushion back massager is a suitable choice if the pain is located at the neck or lower back area. This way, you may place it exactly where you require relief. TENS units are a more high-tech choice, coming with electrode pads that will send pulses on your skin – therefore stimulating your nerves and providing a deep massage. As their name suggests, these are cane-shaped massagers designed to reach particular spots of your back – and therefore provide relief. These massagers are also stick massagers that you use to massage a particular pain point. This unit features nodes that have been carefully placed for you to maneuver over the right spot. These massagers are run over the surface of your skin, rubbing the problem area in an attempt to provide relief and release the tension. Foam rollers feature either a soft or a hard exterior, depending on the degree of relief that you require. You roll it up and down your skin, therefore targeting particular problem areas. 3 Pong mini massagers are small units that can fit inside the palm, being a more portable option. You use them to work out the tension and the knots. The shape of a back massager is very important to consider, particularly if you have a rather difficult to reach pain area. No matter if you go for a chair pad or an S-shaped stick, you need to be sure that it will be able to reach your pain point. It will be very awkward to realize that you bought a chair massage cushion pad for your neck only to realize that it stops just below it, focusing only on your back. For this reason, you might want to ensure that you focus on a massager with all the right curves. Size also matters when it comes to picking the best back massager. Think about how much coverage you need for the unit. Do you need to massage your entire back, or do you only need it to bring some relief for a specific area? 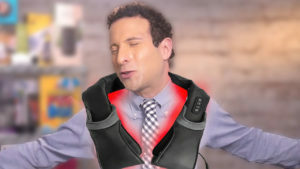 You might not need to purchase a full-sized neck and shoulder massager if your problem only lies at the neck area. Furthermore, size is directly related to portability. Is it too large for you to carry it from one place to another, or is it small enough to pack inside a suitcase? Think of this aspect when making your choice and see how you plan on using it. Back massagers can be electric and non-electric – their efficiency depending on which model you choose. Sometimes, a non-electric back massager might be a more economical solution, whereas an electric massager will allow you to sit back and relax in your favorite chair. Most people find more efficiency in an electric model, whereas the non-electric option is good for low-intensity pain. How many nodes does the back massager of your choice have? In this case, less is not always more. The number of nodes is directly related to the intensity of the massage that you get. Therefore, if you want to get a more intense massage, you may want to go for something that has more nodes available. It is the perfect choice if you need to go for a deep tissue massage, having a relatively high-intensity that you might benefit from. However, it might not be such a good choice if you are looking for a less intense massager. As one might have realized, this feature is based on a Japanese massage technique. If you want to replicate the Shiatsu massage from the hands of a masseuse – but without the actual masseuse – then you might want to consider this feature. Some people want to have handheld control when it comes to their massager – which is why a wand massager (or at least one that includes a wand) may be a more suitable choice for you. It might be slightly more expensive, but the results will certainly be worth the price for some people. For some people, heat is one of the most efficient methods to bring pain relief. Considering that heated skin will block the pain signals by stimulating the sensors, your brain will perceive it as the pain going down. Moreover, not only will it be useful when it comes to pain management, but it can also be a great option during the colder season. Most people experience the worst back pain when the weather is very cold. So, by using a massager with this feature, you will be relieving the pain and you will be warming yourself as well. Certain back massagers will provide additional vibration features – which will provide even more relief from the back pain. If you are struggling with great back pain, then this feature is something that you might want to consider. Sometimes, timers are a great option if it takes a fair amount of time until the source of the pain has been reached. Usually, you will need some “test runs” to determine how long you should keep the unit on. However, once you determine how long it takes until your back pain goes away, you may sit back and relax. You can even take a short nap as the massager is doing its thing. We all have good days and bad days. Sometimes, the pain is small enough to only be considered a “slight annoyance.” Other times, the pain is so bad that it almost makes you want to cry out – and no matter what you do or how you stay, nothing ever seems to work. A massager with an intensity setting might be able to help you out in this aspect. This way, no matter the type of day that you are having, you can choose the intensity the way you want it to, and the massage will be just perfect. If you tend to fall asleep relatively quickly into a massage, then an auto shut-down option might be a great solution for you. This way, you will be certain that the unit will not overheat during your power nap. Bear in mind that if it takes a longer time for the massager to reach the source of your pain, you might want to go for a unit with a longer auto shut down. A shorter shutdown might be highly frustrating. Can the back massager of your choice be recharged, or do you continuously have to change its batteries? Plus, does it work while you are on the go, or do you always have to be “connected” to use it. If you want to make them easier to manage, then you might want to go for a rechargeable option. 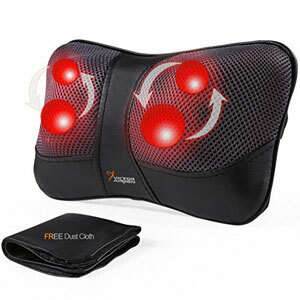 Speed setting and intensity generally go hand in hand – so look at how many speeds a back massager has. Whether you are looking for something gentle or a more rigorous massager, it is ideal that you pick a model with at least two or three settings. Generally speaking, the average back massager will have three speeds: low, medium, and high. However, depending on the model, you might find even more options. These models might be slightly more expensive, but they offer more flexibility. If you are on the road a lot or spend a lot of time at the office, then you might want to invest in a portable back massager. Check whether it is the right size or not, or if it is lightweight enough to be carried around. Of course, if you still don’t have a super comfy office chair, invest on that one in advance! You may also purchase massagers for your car. However, as a driver, you can only use it when stationary (for safety purposes). As a passenger, you can use it at any time. Some people have pain points that are difficult to reach or satisfy. Fumbling for the right intensity can get incredibly annoying, particularly when you have to go through several variations to reach the perfect point. The memory/recall functions will remember your last settings so that you can get the right massage from one press of a button. It’s a very convenient function if the pain generally focuses on one particular spot of your body. Some of the best back massagers will include attachments that will focus on particular different areas. For instance, you may get a massager for your back, and you will also receive an attachment for your face. Can Back Massagers Help You with Back Pain? So, we know that back massagers feel good and that they were made to mimic the movements of a professional therapist. So, to answer whether or not back massagers are good for your back, we need to address another question as well: can massage help with back pain? Facts say that it does. Various researchers brought results in the table. For example, Pain Medicine posted an article describing patients with lower back pain. Upon receiving regular massages every day, 75% of those patients said that they could feel a big difference after 24 hours. Moreover, in another clinical back massage study, a group of patients was broken into two subgroups: one received physical exercise, whereas the other received massages. After 10 weeks of treatment, all 401 people from this study claimed that they felt the results. Similarly, it was discovered that there is little to no clinical difference between the two methods. Considering that back massagers give you the same kind of massage, it is safe to say that they may safely help you with your back pain. So, you are considering the purchase of a back massager – but we all know that research is key, no matter what we want to purchase. So, how does one of these units even work? Well, to put it as simply as possible, the best back massager works by replicating the movements of a traditional massage – those you get at the spa, for instance. However, they will all work differently, considering the technology that they use. A back massager will work by vibrating, kneading, rubbing, or stroking – each of them having different effects. For instance, while the vibration of a back massager may help you relieve tension in your muscle spasms, it may not be as deep as kneading. The latter will work your muscles more efficiently, intensifying your blood circulation. Some massagers also work with pulse technology. Technically speaking, they are not exactly massagers, but electro simulators, but they are still very efficient when it comes to relieving the back pain. Their efficiency has been clinically tested, and there are also two devices that can provide this type of simulation. You have TENS (transcutaneous electroneurostimulaton) that works by the stimulation of the hypodermic nerve, and the EMS (neuromuscular electrical stimulation) that improves the muscle tones of those that are incredibly untrained (even paralyzed). Using a back massager will loosely depend on the type of back massager that you use. For instance, if you use a chair back massager, it is obvious to say that all you have to do is turn the unit on – and lie on the chair. If it is a more “flexible” unit, you will have to place it at the location where you feel your strain. You’ll know what that area will be because you’ll be able to feel a slight discomfort while touching it. After you have identified the area, place the massager on that spot by holding it over the shoulder or beneath the elbow (depending on how easy it is for you). If you are using an electric unit, choose the setting that feels right for you. Press over the area – and after that, move it in circular motions. Repeat this process with non-electric units as well – only apply just as much pressure as it feels comfortable for you. Bear in mind that if you do not sit straight during the massage, it might not be as effective for you. In order for you to avoid dysfunction, you need to maintain equilibrium through your body – which is why you might want to stay as straight as you possibly can. Some massagers may take more involvement from you than others. For instance, a handheld electric massage will have you moving the unit until you reach the perfect spot – at usually a lower intensity. An electric massager, on the other hand, may be able to reach even deeper – being the perfect choice for those suffering from back pain. How long you use these units, it will depend entirely on you. Some people believe that 10 to 15 minutes every day is enough, whereas others prefer to relax for about 20-30 minutes under the effects of the massage. A longer session might be more useful for those suffering from intense back pain – but bear in mind that long session might not always be better. What goes over 30 minutes might actually be more harmful to your muscles. With your pain usually gathering in one specific pain point, you might be asking yourself this: should you go for a massage pillow, or for a shiatsu back massager? To begin with, you must know that the answer is not entirely black and white. For instance, a pillow massager is generally a small pillow that you place beneath your neck as you are lying, or under your lower back. It will tackle that specific point of your body, vibrating or pulsing as it offers you relief. A shiatsu back massager, on the other hand, will use kneading, tapping, or stretching in order to alleviate any potential discomfort. It is a good option for those suffering from chronic muscle pain and needs “in-depth” massaging. Regular pillow massagers provide low to medium intensity massaging, while shiatsu massagers go a few intensities higher. Today’s technology allows us to make the best of both worlds. 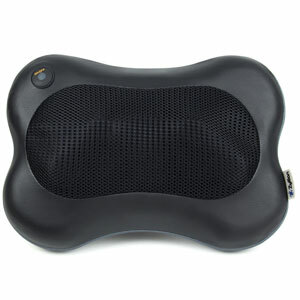 For example, nowadays, you may easily find a massage pillow that also has a shiatsu option. These pillows can also have heating and other convenient features – making them perfect for families that have different needs when it comes to massagers and pressure points. Plus, the advantage of Shiatsu massagers is that no one says they have to be pillow-shaped. You can easily find a shiatsu massager in the form of a chair pad – or even an actual chair massager. If you still don’t know what to choose, here are some questions that have already been answered for you regarding the best back massager. What exactly is a back massager? A back massager comes in many forms and is a device that mimics the movements of a professional masseur to provide relief from pain. How do I choose the right back massager? Generally speaking, a back massager is chosen based on your pain points. For instance, if the pain you feel is generally around your lower back, you should go for a massager that reaches the area. Ideally, you might also want to speak with your doctor, so that they may give you some advice regarding your ailment. Can I use a back massager when I am pregnant? Back pain is often present in a pregnant woman’s life; however, when it comes to back massagers, opinions are mixed regarding their use. It is advisable that you check with your doctor first so that you do not have any side effects. Needless to say, you should also read the instructions before using a back massager. Many units come with precautions and warnings that will tell you whether it is safe to use during pregnancy or not. Is a back massager expensive? That depends on the back massager that you wish to purchase. Some are highly affordable – whereas others are more on the expensive side. For example, an electric chair back massager is certainly going to be more expensive than a 3-pong mini massager. How long should I use the back massager for? This will depend on how long it takes to reach relief. Some people use it for about 10 minutes while others use it for as much as 20 minutes. It will mostly depend on the intensity of the massage, as well as how long it takes until the massage takes effect. Ideally, you might want to use it for around 15 minutes. If you use it for more than that – and especially at a high intensity – you risk bruising your muscles. You might want to go for shorter intervals every day rather than a long session in one go. Also, don’t forget to check out our choices for the massage oil reviews out there! There are so many options when it comes to the best back massager. Sure, non-electric ones are cheaper – but you definitely reap better results with an electric unit. Plus, a non-electric massager has you doing the work yourself – whereas the electric ones will allow you to relax completely. The most convenient options are compact ones, mainly because everyone loves their portability. Regardless, when you purchase the right model for your purposes, you will reap benefits such as pain relief, improved sleep – and an overall better mood. 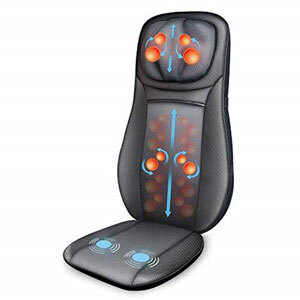 Hopefully, our back massager reviews helped you to find the best massager for your purposes. Some models were less expensive and fairly basic – whereas others came with extra features that made their price worth it. It is up to you to decide which one is actually the best option for you, based on what your priorities are.